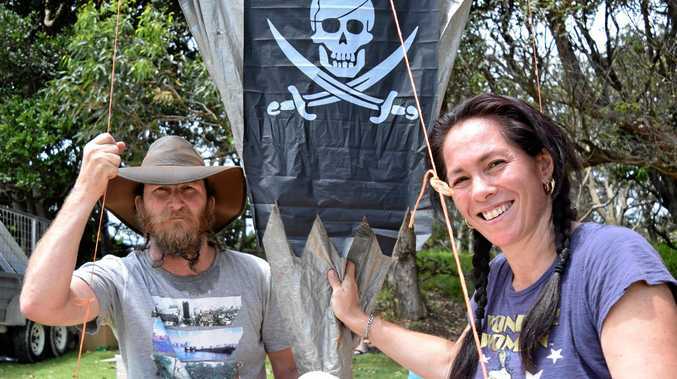 PIRATES AHOY: Steve and Maria Fraser at a past Ballina Prawn Festival. THE popular DIY Raft River Races are back at this year's Prawn Festival to be held on November 12. Past participant Bex Campbell highly recommended the festival experience. "Hubby and I participated in DIY raft building and racing and had such a wonderful fun time. We highly recommend it. We have never laughed so hard and all the people were brilliant and very helpful," Ms Campbell said. To mark the fourth year of the festival, and to recognise the importance of sustainability for the environment, organisers are looking for environmentally friendly and sustainable raft entries this year. To allow for greater use of environmentally friendly and recyclable materials, entrants will make their rafts prior to the event and bring them on the day to the festival to race. Festival director Nadia Eliott-Burgess said: "This year we are stoked to have a $1000 prize pool up for grabs, with categories including best use of sustainable products, fastest time and the quickest or most comical sink. "We have received a bunch of entries,but there are still a couple of spots left, so if you have been thinking about getting on board, now is the time to do it." The raft race is one of the water-based activities at the festival. Make sure you head over to the water's edge to take in the colour and vibrancy of the boat parade. It is such a festival highlight, seeing our fishing trawlers, local boats and fleet of assorted floating craft looking their finest whilst cruising up along our beautiful Richmond River for your viewing pleasure. The festival is a ticketed event and will be held at Missingham Park on November 12, from 10am until 10pm.